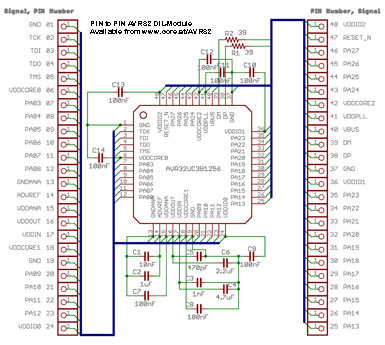 The AVR32 CORE Module is made to make it easy to start development of 32 bit projects. It contains the AVR32UC3B1256 MCU, all the required decoupling capacitors and the required resistors for the USB interface. It is optimized through 18 revisions so far, has minimum track lengths, separate analog ground plane (area), digital ground plane and other features to allow for happy hacking, err, we mean good signal to noise ratio at higher speeds. The module can handle 6 *107 instructions/second And makes every thing in the AVR32UC3B easily accessable in a standard 600 mil DIL-48 package. The device is programmed via a simple connection to the USB bus of your computer. 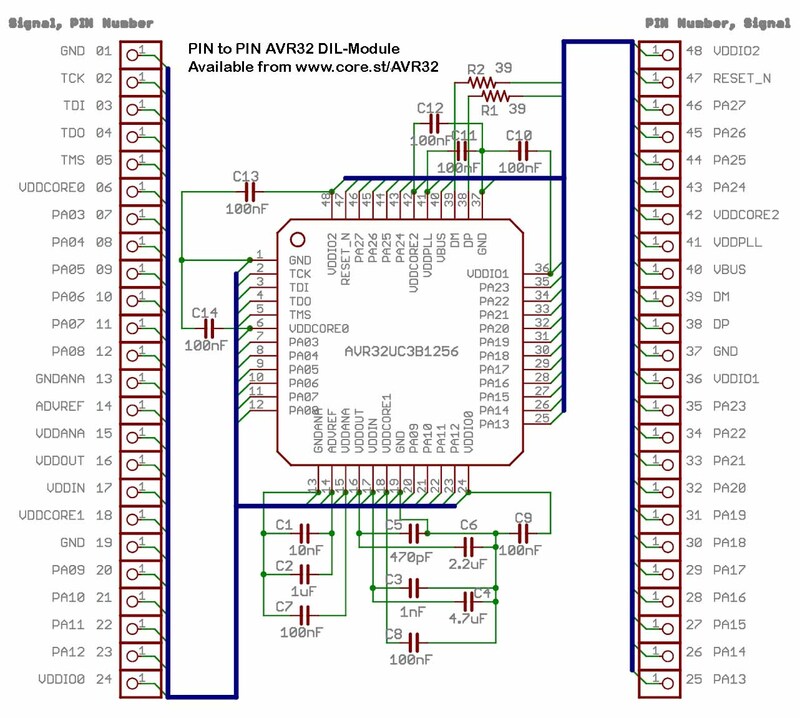 The AVR32UC3B from Atmel is one of the best 32 bit Microcontrollers of today. It has among many other thing PWM's, Full Speed USB, Internal High-Speed Flash, 3 USART, SPI, TWI, 8-ch 10-bit Analog to Digital Converter and MPU. Ever wanted an easy way to access the new AVR32? Here are one new solution which can be used as an AVR32 Stamp or Brainboard with your new projects! 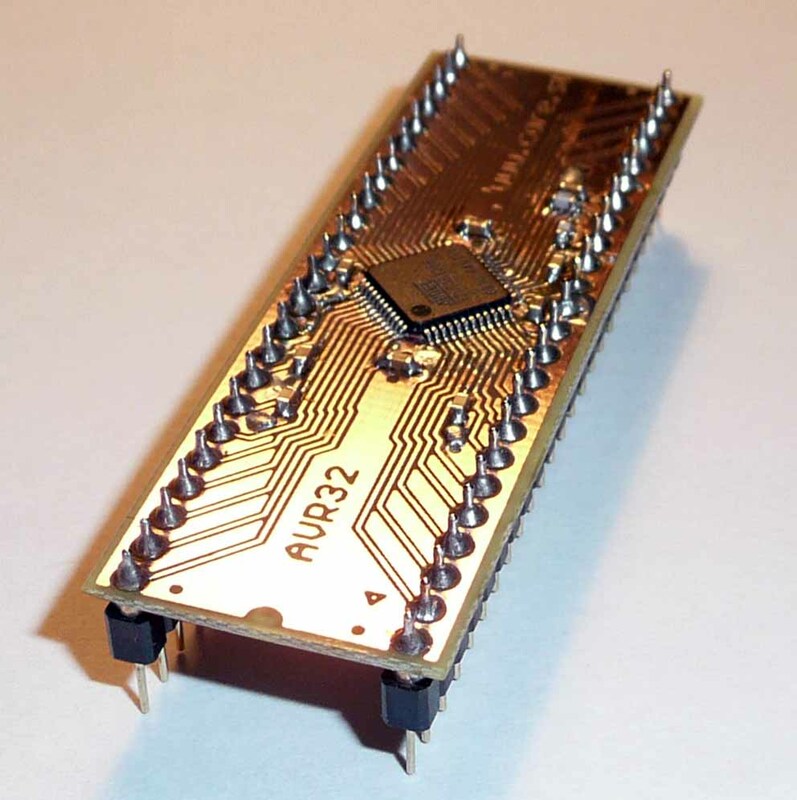 To save money, you here have the option to do the soldering of the AVR32 Core Module yourself. This can only be recomended if you have previous experience of soldering fine pitch SMT. Please understand how limited our ability to help you is with this option: If you fail, you may buy a new finished unit at a small discount.